There is an old Korean saying, "10 years can shape rivers and mountains." Think about the vast amounts of history and all the changes that Hangang (River) and its surroundings must have gone through during the past 2,000 years. Ever since the first civilizations were established in the Korean peninsula, Hangang (River) and its surrounding land has always been considered an important strategic location. During the Three Kingdoms of Korea (57-668), Goguryeo, Baekje, and Silla Kingdoms engaged in countless battles to occupy the areas around Hangang (River).. The stories of Hangang don't end with the history books; the river and its surroundings played a vital role for the everyday life of commoners by providing a source of water and fertile grounds for agricultural. Needless to say, there are countless stories to be told. If you want to hear stories of the Han River and learn about how Seoul changed throughout its history, then take a storytelling tour along the river at Hangang Park. The Seoul Metropolitan Government brings fun and exciting historical stories right to you from four locations around Hangang Park. Take a stroll or a bike ride and discover the interesting stories hidden throughout the Hangang (River). So, let's begin our walk along the Hangang (River), the home to 2,000 years of Seoul's history. The four storytelling courses of the『Arisu Storytelling Tour』each share different historical anecdotes of Hangang (River). 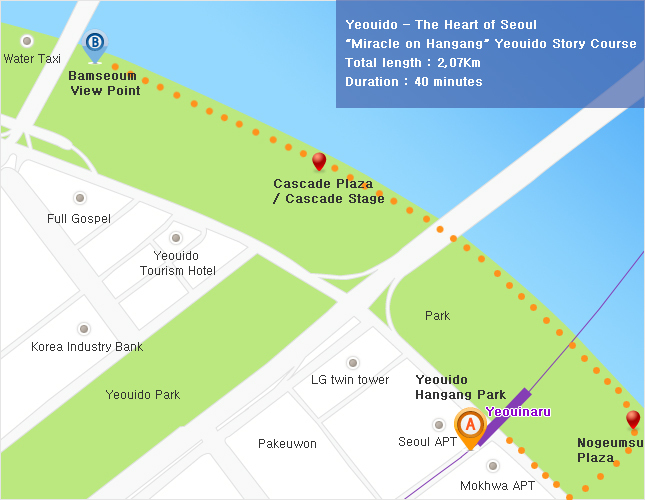 In Yeouido's story course「Miracle on Hangang,you will walk through Yeouido Park and learn about how Yeouido went from a sandy island to one of the busiest districts of Seoul, how the Hangang (River)'s bridges have changed through time, and the history of Maponaru. Learn about how the dumping ground, Nanji, was reborn into an ecological park at「Nanji: Side by Side with Nature」.At「Banpo: Man-made Nature」, you'll see Seoraeseom and the Moonlight Rainbow Fountain, which has been listed on the Guinness Book of World Records; and learn about Joseon (1392-1897) architecture through full-size architectural replicas like the Bateau Bridge. 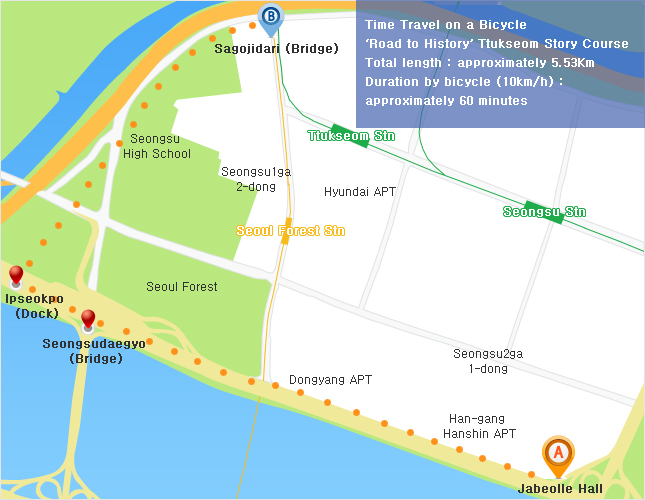 At Ttukseom, you can ride a bicycle andlearn the history of the Hangang (River) through stories of people who enjoyed the river just as much as you do. Home to the financial district, the National Assembly Building, and several broadcasting stations, Yeouido is truly the heart of Seoul. But originally, it was nothing but a deserted sandy island. Yeouido's development directly reflects the development of Seoul. Yeouido Hangang Park has the highest number of visitors among all Hangang Parks, and its well maintained appearance is surely one of the landmarks representing our developed Seoul. 2. Exit 3 is directly connected to Yeouido Hangang Park. Once you enter the park, walk down to the Hangang (River) then and walk towards Wonhyodaegyo (Bridge). You'll soon arrive at Nogeumsu Square, where a cozy playground, benches and trees welcome you. Enjoy the calm atmosphere and relax to free yourself from the stresses of everyday life. Citizens of Seoul are on a restless journey to industrialization and economic development, and Yeouido Hangang Park offers them a getaway from the burdens of life. Han-gang (river), the Arena of the Struggle Among the Three Kingdoms of Ancient Korea. Baekje Kingdom was in control of the river and gained strength as a maritime power, but lost the river to Goguryeo Kingdom by 475. By 553, Silla Kingdom occupied the areas along the river and reached its prime. During the Joseon Dynasty, the Hangang (River) served as an important channel for the transportation of people and goods, including grains collected as taxes, from across the country to Hanyang (present-day Seoul). Yeoeuido is called the Manhattan of the Republic of Korea. Yeoeuido played a central role in the "Miracle of the Hangang (River)," which is a term used to refer to South Korea's rapid economic growth. Yeoeuido and its nearby places, such as Maponaru and Seogangnaru, have been the engines driving the country's economy. During the Joseon Dynasty, commercial districts in Mapo prospered under the leadership of Lee Ji-ham. Currently, Yeoeuido has become a place where many people work hard for the further development of the country's economy. Isabella Bird (or Isabella Bishop), a British travel writer, visited Korea in 1894. From Mapo, she rode a barge and started to tour the Hangang (River). Afterwards, she wrote about her impressions of Koreans – as being a naive and curious people. Her travelogue, Korea and Her Neighbours, introduced what she saw in Korea, which was a country that was little known throughout Europe. Where there are many people gathered together, there are bound to be dishes that are commonly enjoyed by them. Then, what was a favorite dish at Maponaru? The answer is Seolleongtang (ox bone soup). Mapo Seolleongtang is a specialty food of Seoul. One day in 1926, The Dong-a Ilbo referred to the dish as follows: "Seolleongtang is a specialty food of Seoul. It is quite easy to find an eatery selling it in Seoul." It was this dish that the sick wife of the poverty-stricken hero used to pester her husband for in Hyun Jin-geon's novel, A Lucky Day. In the last scene of the novel, the hero Kim cries out while rubbing the face of his dead wife with the palm of his hand, "Here is Seolleongtang, my dear, that you wanted to eat so much. I wondered why I was so lucky today." Mapodaegyo (Bridge) over the Hangang (River) used to be a place where many people chose to commit suicide. In an effort to remedy the situation, Seoul Metropolitan Government put a message asking people to think about the value of life again and renamed it the Bridge of Life. A place under the bridge became the site where the blockbuster film The Host (directed by Bong Joon-ho) was filmed. The film set a domestic box office record in 2006 and was invited to the Cannes Film Festival. The Seoul Color Park was created under this bridge and has become a favorite destination for pedestrians and bikers alike. Storytelling about the Hangang (River) (4) – It may hide somewhere near the river. Film director Bong Joon-ho got an idea for the film The Host when he happened to pass the area under the bridge. The film drew in a box office hit of 13.02 million tickets, setting off a whirlwind, in 2006. When you walk towards Mapodaegyo (Bridge) and pass under the bridge, you'll be greeted with a beautiful fountain square. Next to it is Cascade Stage, the world's first retractable water stage. Its geometric model and beautiful dome shape demonstrate the Hangang (River) and Yeouido's transformation into an advanced and modern resting area. 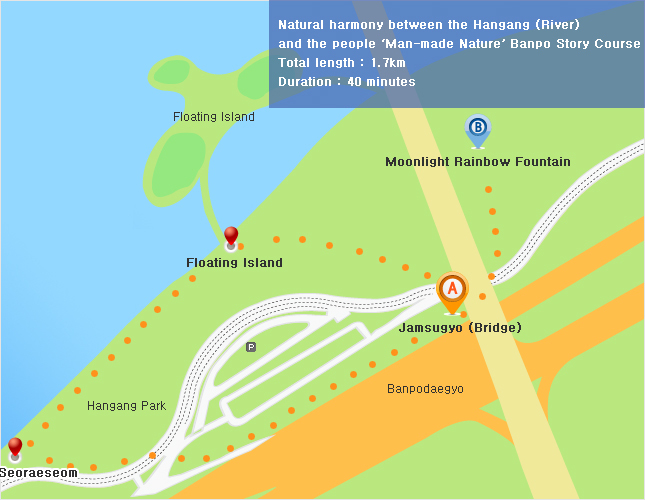 Storytelling about the Hangang (River) (5) – It may hide somewhere near the river. After you pass Cascade Stage, you'll see Bamseom across the Hangang (River). Because of its excellent view, Bamseom was known as Yuldomyeongsa, one of Mapo's eight beautiful sceneries. After its explosion in 1968, reeds start to grow in the 90s and water birds returned to the island. Bamseom is now recognized as the precedent of the Hangang (River)'s ecological restoration. The resurrection of Bamseom allows us to realize the importance of the nature we neglected for so long. Bamseom is currently protected under the International Ramsar Convention for Wetland Preservation. Originally, the name of the mountain close to Bamseom (islet) was Nuesan (Nue is Silkworm in Korean). It came to be called Jeoldusan (meaning "the mountain where many heads were cut off"), after many Catholics were beheaded here during the regency of Heungseon Daewongun (King Gojong's father) in 1866. In fact, Daewongun had no ill will towards Catholicism at first. Even his wife was a Catholic. The persecution against them was in response to the invasion of Asian countries by Western powers. It is said that Daewongun's wife did not give up her belief in Catholicism. Perhaps, she wanted to find consolation in religion amidst the disturbing reality in which she lost her two younger brothers due to the political struggle between her husband and her father's kinfolk. The remaining Catholics kept the soil from the site where their fellow believers were executed and used it to make bricks for the construction of Myeongdong Cathedral in Seoul 26 years later. Bamseom (Islet) comes into view beyond the Floating Stage. This place had been called one of the eight top sceneries in Mapo. It had been forgotten for a long time, but in the 1990s, a reed grove was formed and swimming birds returned to the area. People were awakened to how important it was to protect the ecological system. At present, the islet is protected under the Ramsar Convention. In 1916, an epoch-making event occurred in Yeoeuido, which had been a wasteland. An airfield was built. In 1917, Art Smith, an American pilot, amazed people here with his stunt flying. Yeoeuido was also the place where the country's first aviator, Ahn Chang-nam, and aviatress, Kwon Ki-ok (the first Korean female aviator), developed their skills. In short, Yeoeuido was the place where the country's first generation of aviators cultivated their dream of aiming high. You cannot talk about Seoul without talking about the Hangang (River). Novelist Kim Hoon talks about frequently visiting the river for fun when he was young. He says that he still pays visits to the river often and recalls his sweet memories of the past. The Hangang (River) has been his closest friend. Here, you'll see diverse artwork and have access to all the information you want on the wild animals of the Hangang (River). In addition, head to the rooftop to see the wide ecological wetland center and beautiful scenery of Hangang Park's nature. Nanjido (Island) used to be a beautiful place. Fifty years ago, it was a favorite destination for honeymooners. This area once accounted for about a third of the peanuts grown in the country. It had a reputation as being an "island of trash," as it became Seoul's official dumpsite in 1978. 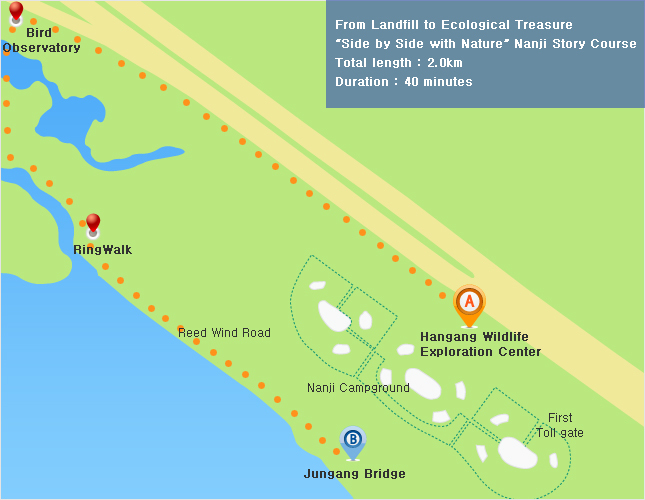 With the opening of the Gimpo Landfill Site in 1991, Nanjido (Island) ceased to serve as a dump site. The place has been reborn as an eco-park, following a process of stabilization via the treatments of leachate and noxious gas. Get the closest view on diverse migratory birds that visit the Hangang (River) in the winter. Professor Yoon Moo-boo, a renowned ornithologist, used to watch birds at the Hangang (River) to inspire his dreams. He now recommends this observatory as the best spot for observing birds of the Hangang (River). The first time when he saw a hoopoe with its distinctive crown of feathers, the young boy Yoon Moo-boo started building his passion for birds. He liked paying visits to the Hangang (River) to watch the birds. His zeal for birds helped him get over a stroke that he had suffered. Eventually, he became a world-renowned bird specialist. The Hangang (River) helped the boy who was full of curiosity find his future career. In this course, a circular wooden deck traverses an ecological wetland center. The walkway takes you to top of the Hangang (River)'s water. You can get the closest look of the river from any angle on this course. You'll also be sharing the road with resting birds while enjoying being one with nature. Every winter, Seoulites are happy to see loyal visitors return to the Hangang (River). A 56 kinds of migratory birds come here. They include white-tailed sea eagles and Stella's sea eagles, which are endangered species. As such, the Hangang (River) is a nice place to observe many kinds of migratory birds. A beautiful reed forest decorates the riverside, allowing you to enjoy reeds and two natural ecologies of the Hangang (River) at once. You can escape from the city's congestion and enjoy the river breeze and dancing reeds here. It is also the best place to enjoy the sunset. 1. Buses 143, 401 and 406 – Get off at Hangang Park at the southern end of Banpodaegyo (Bridge). 2. 1) Walk about 15 minutes from Exit 8-1 or 8-2, Express Bus Terminal Station, Subway Lines 3, 7, 9. 2) Walk about 20 minutes from Exit 1, Sinbanpo Station, Subway Line 9. Banpodaegyo (Bridge) is high and long. But once you pass through the underground passage and arrive at the end of the tunnel to Banpo Hangang Park, you'll be greeted with a stunning view. There's one more bridge under Banpodaegyo (Bridge) that stretches directly above the water surface. This bridge's name is Jamsugyo (Bridge). Jamsugyo means 'bridge that dives' in Korean. And this bridge, constructed in 1979, does exactly what its name says – it likes to dive. When the water levels of the river rise during the monsoon season or heavy rain, Jamsugyo (Bridge) submerges underwater. The bridge is a boasts a special view and is only allowed to be used on foot on clear days. Because you can walk right above the Hangang (River), many love to take walks along Jamsugyo (Bridge). It also tells us the water level of the Hangang (River) during rainy season and provides us with important strategic value during wartime. Note: Access to Jamsugyo (Bridge) is restricted during heavy rain, so make sure you check the weather first. Buildings rest on the water's surface of Banpo. Are they going to float away? Don't worry. Floating Island is the first materialized floating architecture, in which buildings were constructed on top of floating materials. This is the result of a 2007 idea intended to create a new landmark for Seoul on the Hangang (River). The three islands are connected to the bottom of the river with chains and cables, and these islands are connected by bridges so that the islands and Banpo Hangang Park are structurally connected. Floating Island shows off its extravagant appearance and performs diverse functions of scenery, entertainment, conventions, water sports and more. In addition, Media Art Gallery, which is attached right next to the island, allows the hosting of various events and performances with its gigantic LED and comprehensive directing systems. A design panel shaped like an ice cart is placed in an open space next to the Media Art Gallery. It is associated with Seobinggo (an Ice Storage Space in the West) in Ichon Riverside Park across the river. During the Joseon Dynasty, ice was collected from the frozen Hangang (River) in the winter and was kept in a storage space to be used at rites that were held to pay homage to deceased ancestors between March and October. Seobinggo was the country's largest ice storage space and is composed of 8 underground shacks that are covered with straw. The practice of collecting ice for later use dates back to the Three Kingdoms Period. The ancestors paid homage to the deity of ice before the collecting ice from the Hangang (River). Yellow rapeseed blossoms cover the island in the spring, and white buckwheat flowers show off their scent in the fall. Diverse flowers and plants come and go throughout the year, and a beautiful reed field and waterside walkway endlessly attract lovers to this pride of Banpo. Seoraeseom is considered to be one of the most beautiful places in Seoul. Seoraeseom wasn't always located on the Hangang (River). During the Joseon Dynasty, a sandy island called Gido existed, but was replaced with an artificial island during the Hangang general development of 1980. There were many disputes at first; many argued that the construction of an artificial island would cause problems in the flow towards Jamsugyo (Bridge) during a flood. But ultimately, people needed an island that was more than just a protection from floods. They wanted an island that offered a resting area for the citizens of Seoul, and they wanted people to realize that we can live along with the river once again. The result was the birth of Seoraeseom. Note: There is a Seoraeseom rapeseed blossom festival in the spring and a Seoraeseom buckwheat flower festival in the fall. During the reign of King Yeongjo, Crown Prince Sado (also known as Jangheon) lost his life as a scapegoat of political struggle. Next, King Jeongjo (r, 1776-1800), a son of the ill-fated crown prince, relocated his father's tomb to Suwon and paid frequent visits there to pay homage to his deceased father. He had to cross the Hangang (River) to get to Suwon. At that time, the king was not supposed to ride on any boats, which was supposedly due to safety reasons. As such, the only choice was to build a pontoon bridge. King Yeonsan (1494-1506) also crossed the river using a pontoon bridge, to go hunting in Cheonggyesan (Mountain). Banpo Hangang Park is even flashier at night. Banpo houses a water fountain that's been listed in the Guinness Book of World Records. But you won't be able to find the fountain too easily. That's because the fountain is right above you. Moonlight Rainbow Fountain has been recognized as the longest bridge fountain in the world. It spreads its wings of water from both sides of Banpodaegyo (Bridge). There's even more. It moves dynamically to music as if it were dancing, and 190 scenic lights illuminate to dye the waters in an array of every color. Note: Moonlight Rainbow Fountain isn't available at all times. It is only displayed every 15 minutes. The show is held twice during the weekdays at 20:00 and 21:00, and three times during weekends and holidays at 20:00, 20:30, and 21:00. And keep in mind that the hours of operation are subject to change due to weather such as rain or storms, various events, or energy saving requirements. For reference: : The water fountain is operated at 8:00 and 9:00 PM on weekdays and 8:00, 8:30, and 9:00 PM on weekends and holidays between April and October, except for on a rainy or stormy day. The operating hours are subject to change. A place for bike rentals: On the left below the stairs outside Exit 3, Ttukseom Station, Subway Line 2. Go to exit 3 of Ttukseom Park Station's subway line 7 and walk on the passageway. It'll take you to View Culture Complex. Jabeolle Hall, which means inchworm pipe in Korean, is a renowned attraction of Ttukseom Hangang Park. It is a long and thin pipe-shaped structure that looks like an inchworm's larva. Various exhibitions take place inside Jabeolle Hall throughout the year. There are also other facilities including an observatory, rest area, restaurant, and café that offer a cultural rest area for visitors. Enter through exit 3 of Ttukseom Park Station's subway line 7. During the Joseon Dynasty, Ttukseom served as the royal hunting grounds. According to records, eight kings from King Taejo through King Seongjong hunted there on a total of 151 occasions. A large banner would be hoisted to announce that the king was there. The banner was called dok or ttuk. Hence the name of Ttukseom. There was also a large horse ranch located here and kings carried out troop inspections in Ttuksoeom. Seongsudaegyo (Bridge) cannot be left out from the modern history of Korea. On October 21, 1994, Seongsudaegyo (Bridge) collapsed. At the time of the collapse of the Seongsudaegyo (Bridge), a brigade of young policemen who had narrowly escaped the accident in a mini van made the self-sacrificial effort to rescue those in danger. While it was a national shock, it also left a heart-warming story of policemen who rescued people during the collapse. These are all valuable stories that must be told throughout history. There's a passage to Seoul Forest here, so you can choose to enter Seoul Forest for a walk. But mostly, this is the best place for a break from riverside bicycle riding. Seoul Forest lies near the north end of Seongsudaegyo (Bridge). A galloping horse-shaped statue is set up at the entrance to Seoul Forest as a marker for a racecourse racetrack? that used to be there. Ttukseom has long been associated with horses. During the Joseon Period, a horse ranch was located there. A racetrack was opened there in 1954. The racetrack was replaced by a newly built one in Gwacheon in 1989. Bronze statues of horse jockeys in Seoul Forest remind visitors of the former racetrack. Ipseokpo (Dock) was a small port located at the point where the Hangang (River) and Jungnangcheon meet. The name Ipseokpo came from Chinese words meaning large stones stand around the Hangang (River) like people. In Korean word, people called it Seondolgae. Maebong, which forms a small boundary between Geumhodong and Eungbongdong, is the house to Seokpo, a riverside road in the south of Hangang (River). Seokpo was originally known as 'Ipseokjoeoh,' which was one of the ten most beautiful sceneries of old Seoul. Its breathtaking scenery includes rocks that protrude towards the river and large stones on the site where the Hangang (River) and Jungnangcheon meet. Ipseokpo is also a great fishing site. Large standing rocks naturally formed along the river made it fit for angling. Many anglers used to dream of catching wolcheok (a freshwater fish larger than 30 cm) here. Locals used to think that the large standing rocks had magical powers and prayed to them to grant their wishes. Right before Jungnangcheon (Stream) and Cheonggyecheon (Stream) meet before entering the Hangang (River), there is a small stone bridge above Seongdonggyo (Bridge), the bridge that connects Sageun-dong and Seongsu-dong. This bridge, located right next to Hanyang University, is the oldest existing stone bridge in Korea, and it was designated as historic site number 160 on December 15, 1967. Over half of the bridge was originally damaged and lost, and the city of Seoul repaired and restored it in 1973. The original name of this bridge was 'Jebangyo,' as named by Seongjong, the 9th king of the Joseon Dynasty. But many people of Joseon called the area around this bridge Salgojibul, and thus gave a new name to the bridge, 'Salgojidari' The original name of this bridge was Jebangyo, as named by Seongjong, the 9th king of the Joseon Dynasty. But many people of Joseon called the area around this bridge Salgojibul, and thus gave a new name to the bridge, Salgojidari. King Taejo, who was the founder of the Joseon Dynasty, intended to hand over the throne to the youngest son, Bang-seok, although another son of his, Bang-won, had done a lot to help him found the new dynasty. Angered by his father's decision, Bang-won killed his other brothers and became the third king of the dynasty. King Taejo did not want to see Bang-won any more and left for Hamheung, which was hundreds of kilometers away from Seoul. Finally, at the continued requests of Bang-won (King Taejong), King Taejo returned to Seoul. King Taejong went out to welcome his father at Ttukseom, where King Taejo, a renowned archer, shot an arrow at his son, but King Taejong nimbly dodged it. The father considered this to be a sign of God's will and recognized his son as the king. The place came to be called Salgojibeol (the field where the arrow was shot). In joy and in sorrow, the Hangang (River) has been quietly flowing around us. How about walking along the heart of beautiful Hangang (River) for a mind-resting day? The road to the Hangang (River) welcomes you always.